The large military deployments observed in the past in Iraq and Afghanistan are now being replaced by a scattering of smaller deployments and theaters around the world. Peacekeeping and first responder operations are shorter and more agile. In addition to flexibility, there is the need to communicate anytime and anywhere to provide near real-time situational awareness and have information superiority over any adversaries. First responders need to set up communications as quickly as possible in disaster areas to activate logistical support, sending out first reports and starting their emergency activities. The multitude of sensors and multimedia services (video, data, voice) on board these OTM and OTP platforms have increased the need to support growing volumes of throughput over reliable satellite links. Traditional narrow-band and legacy VSAT solutions find difficulties in coping with these new requirements. Disruptive VSAT technologies are taking over this market at a quick pace. In regard to traditional Fixed Satellite Services (FSS) satellite capacity, the market research company Northern Sky Research (NSR) reports a growth rate of between 7 and 12 percent in the amount of shipments of Satellite Communication (SATCOM) systems for OTM and OTP applications. The main market growth however can be seen in High Throughput Satellites (HTS), increasing from 25 to 53 percent over the coming years. Although the new HTS constellations solve the throughput requirements, they increase the complexity of OTM and OTP applications as the satellite beams become smaller and traveling between the different beams requires sophisticated beam switching solutions. MF-TDMA waveforms on HTS satellites. The increase in OTM and OTP communications over satellite presents a set of technical challenges that need to be addressed. To develop an efficient OTM and OTP VSAT network requires a deep understanding of end-user government and defense operations, innovative technologies, new satellite constellations and a need to overcome various technical challenges. In this article, seven technology challenges will be presented and then they will be matched with the disruptive and innovative technology on board the Newtec Dialog® VSAT platform in order to provide seamless, efficient and multiservice communications over satellite. 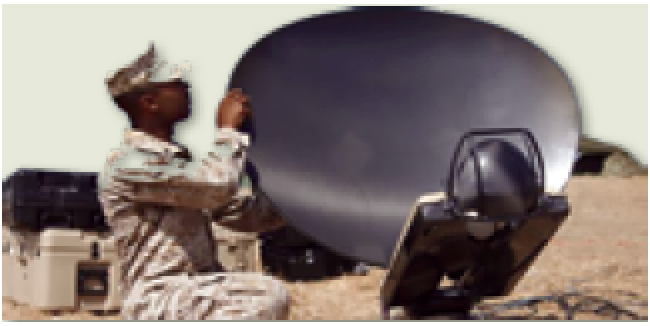 OTM SATCOM terminals use very small antennas mounted on airborne, land and naval platforms. These are often restricted in form factor. OTP SATCOM terminals need to be small to increase transportability and facilitate easy installation. Antennas of this dimension greatly limit the achievable link budgets of a satellite network. In addition, the pointing error and focus of such antennas often requires using efficient modulation and power spectral density reduction technology to mitigate Adjacent Satellite Interference (ASI). The new-generation OTM antennas sit flat on top of the platform and use phased array antenna technology. Although these low-profile antennas provide better aerodynamics, they can cause scan angle issues, resulting in low performance and ASI again. The scan angle depends on the elevation angle of the satellite and the orientation of the OTM platform and its antenna vis à vis the satellite and the geostationary arc. In government and defense operations, such as Intelligence Surveillance and Reconnaissance (ISR), near real-time situational awareness and detailed information is required to make correct decisions. Different video and sensor technologies consume significant capacity on the satellite transponder. Raw HD video imaging and sensor technologies such as hyper– and multispectral imaging, infrared etc., already account for a few hundred Megabits to a couple of Gigabits worth of content. Part of the data can be pre-processed on board or analyzed after the mission. However, for real-time operations, a maximum throughput is required. 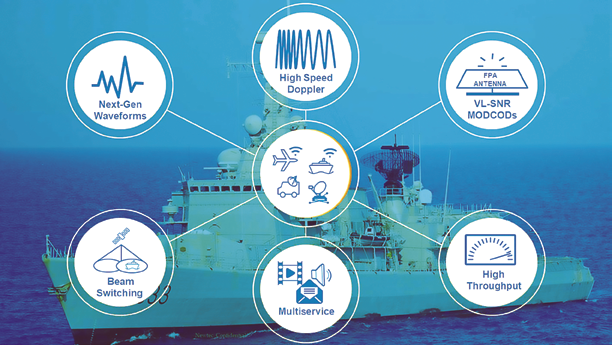 In naval applications, extra capacity is needed to support welfare and e-medicine services, as well as tactical and video conference communications. During an operation, the throughput needs to be shared over multiple OTM and OTP remote terminals on the same satellite network without creating congestion. As such, the VSAT platform needs to be bandwidth-efficient and flexible at the same time. Although traditional FSS wide beam satellites are still dominating the government, defense and disaster recovery satcom market, they are gradually being replaced by upcoming HTS constellations. 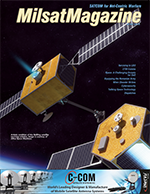 The new HTS satellites bring several advantages. A key one being the increased throughput and the reduced costs per bit compared to traditional widebeam systems. Newer generation HTS systems allow bandwidth to be moved, or reallocated, in real-time, enabling optimal resource allocation based on changing operational requirements. The high gain spot beams of HTS satellites support the usage of smaller user terminals for OTM and OTP applications. On the other hand, HTS satellite constellations increase the complexity of the network and the ground infrastructure. An efficient handover needs to be considered when terminals move across spot beams. When operating in higher frequencies such as Ka-band, the OTM and OTP links become more susceptible to atmospheric conditions which could affect the availability of the SATCOM service. Adding Low Earth Orbit (LEO) and Medium Earth Orbit (MEO) to the equation will reduce the delay time over satellite but, at the same time, require more sophisticated (tracking) antenna technologies. The government and defense platforms and vehicles requiring connectivity could either be moving around (OTM) or be temporarily stationary (OTP) during the transmission over satellite. This movement has an impact on satellite communications and the required technology to compensate it. Naval vessels, for example, are moving slowly but are being rocked sideways, up-and-down and front-to-end by the waves. ISR aircrafts are flying at a higher speed and make roll, pitch and yaw movements to fly specific ISR patterns during operations. During these movements, the antenna could face shadowing effects because the tail and wings of the aircraft partly block the line-of-sight between the antenna and the satellite. Skew angle issues, as discussed earlier in the article, also come into play. Land vehicles are the most difficult to deal with for OTM satellite communications, as shadowing and blockage effects are a continuous concern as a result of driving under bridges, through forests, mountainous regions and cities. All of these vehicles are expected to operate in rugged terrain, advancing at various speeds and taking sudden corners. Technologies to quickly recover the link after an outage and compensate for the movements are required to maintain service availability and avoid ASI. A key requirement for peacekeeping and first responder operations is the service availability and link reliability. Losing the satellite signal could have serious consequences such as endangering human lives, compromising the operation or losing important data which could hamper the decision-making process. Legacy VSAT equipment with basic adaptive modulation and mobility features still have to deal with minutes of outage due to rain fade, interference, shadowing effects, or sudden link outages. Additionally, in a global network with HTS spot beams, technology to efficiently manage the switching between different beams and different satellites needs to be in place. A scalable network should be able to handle multiple operations, platforms and services without compromising on availability, reliability or efficiency. With the continued proliferation of OTM and OTP platforms for peacekeeping and first responder operations on top of ever-increasing budget constraints, the requirement for small Size, Weight and Power (SWAP) has increased significantly. At the same time, cost (C) needs to be limited. With the reduced SWAP designs, the satellite terminals become easier to transport, carry and set up for OTP applications, as well as being as easy to mount on naval and airborne platforms as on land vehicles. Smaller, lighter terminals require less power consumption, a lighter battery and are less demanding on the generator, as well as offering a wider operational span. The longer ISR aircrafts such as Remotely Piloted Aircraft Systems (RPAS) can be kept in the air, the more effective and efficient the operation. The Internet of Things (IoT), 5G and autonomous and connected vehicles are among the most heavily researched technologies in regard to communication systems. As the technology has evolved over the past decade, the requirement to keep people, devices and machines connected is on the rise. When translating the connected and automated vehicle for the government and defense market a lot of applications become apparent. The lack of availability of network services in remote terrains, deserts, oceans, and mountains has produced a growing need to adopt satellite-enabled IoT applications in the defense sector. These connected devices include GPS and tracking systems, health and personnel monitoring devices, along with just-in-time equipment maintenance to support tactical reconnaissance. 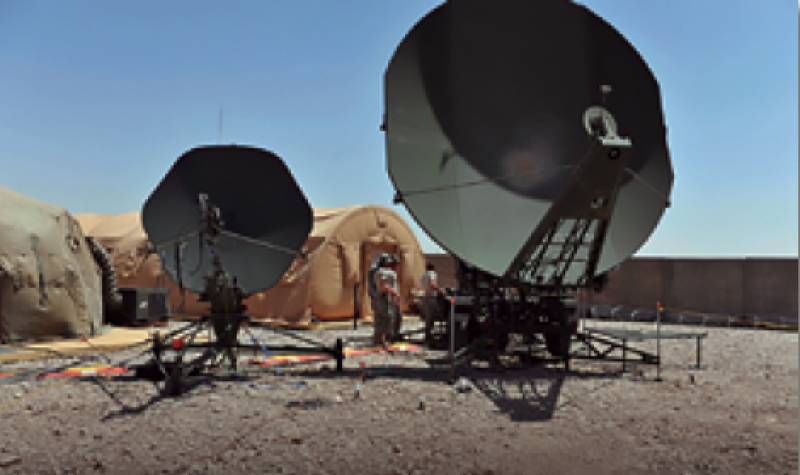 Armed forces across the globe have been dependent on satellite-enabled connectivity to support their bases and personnel. Along with this, the technology aids in the predictive maintenance of aircraft or other equipment that uses real-time IoT data to schedule repairs before breakage occurs. The connected and autonomous cars, for example, give government and defense agencies the ability to send out convoys of connected trucks to carry supplies to difficult, dangerous or hard-to-reach areas without endangering the lives of their deployed logistical staff. Now that the challenges of setting up a network for OTM and OTP platforms are understood, focus can be concentrated on the solutions Newtec can provide through the Newtec Dialog multiservice VSAT platform. Only disruptive innovations in the SATCOM and MILSATCOM context will be able to respond fully to today’s and tomorrow’s requirements for government and defense networks. The Newtec Dialog platform is a scalable, efficient and flexible multi-service satellite communications platform that allows network operators and satellite service providers to build and adapt their networks easily as peacekeeping, conflict and first responder operations evolve. As such, Newtec Dialog gives them the power to offer a variety of OTM, OTP and fixed services while making hassle-free decisions on which technology to use. A set of key technologies bolsters the high availability platform to offer highly reliable services at unsurpassed efficiencies. This addresses the continued pressure on the ever-increasing need for more data throughput. The VSAT platform consists of a variety of hub and modem flavors adapted to the type of network (wideband or HTS) and applications (OTM, OTP, Fixed VSAT). The open Application Programming Interfaces (APIs) on board the Newtec Dialog platform facilitate interfacing with higher layer Network Management Systems and external Mobility Managers to a high degree. As such, the Newtec Dialog VSAT system can be easily plugged into global satellite networks or Pool and Sharing initiatives. • A combination of smaller roll-offs (5, 10, 15 percent) and advanced filtering technologies to allow optimal carrier spacing. Compared to DVB-S2, the combination brings efficiency gains of up to 15 percent. • The DVB-S2X standard increases the granularity in the MODulation and CODing (MODCOD) schemes and Forward Error Correction (FEC) choices. The amount of MODCODs has grown from 28 in DVB-S2 up to 116 in DVB-S2X, bringing efficiency as close to the theoretical Shannon limit as possible. • Adding higher modulation schemes such as 64, 128 and 256APSK dramatically increases efficiency in high speed applications with improved link budgets provided by bigger antennas and more powerful HTS satellites. • DVB has added nine extra Very-Low Signal-to-Noise (VLSNR) spreading MODCODs to the DVB-S2X standard in the QPSK and BPSK range to mitigate heavy atmospheric fading and to enable the usage of smaller antennas for applications OTM (land, sea, air). 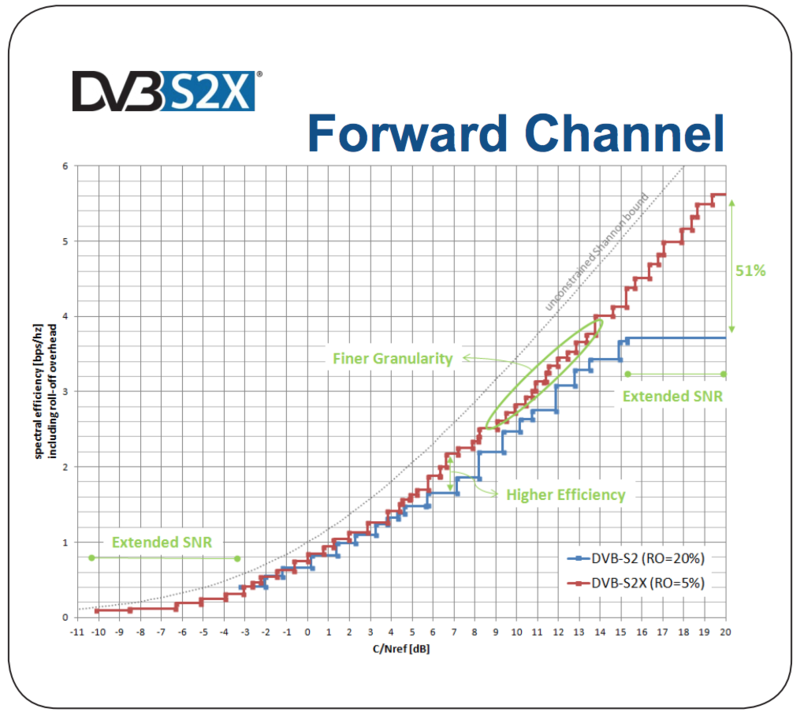 • The DVB-S2X standard supports new wideband transponders that are becoming available today. The introduction of the wideband technology also adds an extra 20 percent efficiency gain for legacy 72 Mbaud transponders. Current Newtec Dialog modems support 500 Mbaud wideband transponders today. • Other DVB-S2X implementations are providing different classes for linear and non-linear MODCODs, Channel Bonding and additional scrambling sequences. More information can be found in the Newtec white paper on DVB-S2X on the Newtec website. Figure 1. DVB-S2X waveform in the forward link of Newtec Dialog platform. Figure 2. Newtec Mx-DMA waveform in the return link of Newtec Dialog platform. Newtec Mx-DMA is the next-generation dynamic bandwidth allocation return waveform featured on the innovative Newtec Dialog platform and provides high-quality, efficient and reliable links for government, defense and first responder network operators to ensure smooth and seamless operations. The satellite waveform is fully adaptive to changing traffic, environmental and operational conditions. Newtec Mx-DMA allows network operators to deploy anything between dedicated to low-to-medium overbooked services at any given time and at minimum space capacity cost. 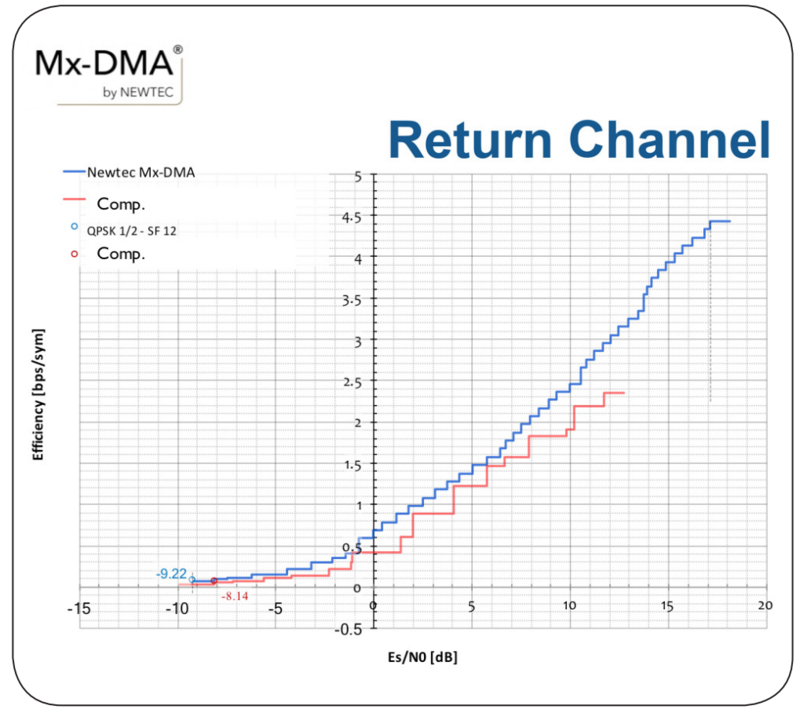 In technical terms, this translates into the fact that Newtec Mx-DMA cross-correlates and assigns in real-time. Return frequency plan, symbol rate, modulation, coding and power-based on return traffic demand, QoS management and channel conditions are all adapted simultaneously for each terminal in the network every single second. As such, a secure and efficient government grade frequency hopping plan can be achieved. With each carrier assigned to just one terminal, highest return SCPC-like efficiencies are obtained while maintaining the flexibility of MF-TDMA. Next to industry-leading efficiencies, the Newtec Mx-DMA waveform incorporates several benefits to connect OTM, OTP and fixed Beyond Line of Sight (BLoS) operations over satellite. • Implementing Newtec Mx-DMA for peacekeeping and first responder management operations immediately results in important efficiency gains (30 to 50 percent) in satellite bandwidth, which can be exploited for different purposes from providing double throughput in the same bandwidth to increasing service availability, cutting costs or a combination of these scenarios. • Unlike other return technologies on the market, Newtec’s patented Newtec Mx-DMA carrier resizing based on incoming traffic is seamless with zero packet loss and almost no jitter. The Newtec Mx-DMA does not need a buffer to tear down and pull up a carrier with every change in traffic. The seamless changes provide the government and defense end-user with full and continuous situational awareness. • Keeping the satellite link alive and maintaining maximum service availability for mission critical communications is imperative for peacekeeping and first responder operations. The availability of such a service is defined by the capabilities of the technology to handle a certain amount of fading effects such as rain, interference and shadowing. Here, Mx-DMA works with Newtec technology implementations such as FlexACM, statistical multiplexing and deep fading compensation at the lowest margin to optimize bandwidth usage and service availability. • The Newtec Mx-DMA waveform incorporates a set of Very Low Signal-to-Noise (VLSNR) spreading MODCODs as part of the full Newtec Mx-DMA MODCOD range. These VLSNR MODCODs facilitate the use of small and phased array antennas, counter deep fading effects and secure communications when the carriers are hidden in the noise. At the same time these Mx-DMA VLSNRs are 100 percent more efficient compared to legacy spread spectrum implementations. In the next chapter these VLSNR MOD-CODs will be discussed in more detail. • Newtec modems running Mx-DMA provide a significant step forward for SWAP-C requirements. With the efficiency gains, smaller terminals can be used to reach the same throughput demands. At the same time smaller terminals also require less power, are lighter and less costly. On top of that, Newtec Mx-DMA implements automatic uplink power and regrowth control for the Newtec terminals reducing the need for a more powerful or expensive Block Upconverter (BUC) while still achieving higher throughputs. • Instead of engaging in a manual and time-consuming capacity management and carrier planning workflow as in SCPC and MF-TDMA networks — where for every change in the carrier plan a human interaction is required — Newtec Mx-DMA automates the process. The start frequency and stop frequency are defined at the initial carrier planning phase. Within that bandwidth envelope, the different carriers for each terminal will be dynamically assigned by the Newtec Dialog Hub. Newtec Mx-DMA takes over from that point on. Every change in incoming traffic or link conditions will be automatically managed. No human intervention is required anymore at the Network Operations Center (NOC), except for monitoring and control. • More information on Newtec Mx-DMA can be found in the Newtec articles: ‘Five Steps towards Efficient Peacekeeping Operations’ and ‘A Tale of 3 Return Technologies’ on the Newtec website. OTM applications increasingly demand the installation of extremely small, equivalent, aperture antennas. These antennas limit the link budgets of the network. In addition, the high pointing error and wide beam-width of such antennas often require the use of inefficient power spectral density reduction technologies like spread spectrum to mitigate ASI. The Very Low Signal-to-Noise (VLSNR) MODCODs inside the Newtec Dialog Mx-DMA waveform compensate for these effects by dynamically spreading power over a higher symbol rate when needed. Newtec Mx-DMA has 10 VLSNR MODCODs which spread power per terminal and per frame rather than spreading per carrier. The huge advantage of the Newtec Dialog Mx-DMA VLSNR MODCODs is that they are an integral part of the overall Mx-DMA MODCOD range. Compared to legacy MF-TDMA-based VSAT systems, there is no need to provision extra satellite bandwidth to cater for the spreading MODCODs. Additionally, there is no buffering or switching required which could lead to packet loss. In conjunction with Newtec’s adaptive modulation technology, FlexACM, the modulation can change from 8PSK to a VLSNR MODCOD, with a spreading factor of 12, in a matter of a second in case of a sudden deep fading effect without impacting neighboring carriers in the bandwidth envelope. Implementing the Newtec Mx-DMA VLSNR MODCODS in a satellite network with OTM and OTP platforms increases overall performance by 100 percent when compared to legacy VSAT networks. The extra benefit from implementing the VL-SNR MODCODs for government, defense and first responder networks is that they provide extra security and resilience alongside the Newtec Mx-DMA government-grade frequency hopping on board the Newtec Dialog platform and typical encryption standards. When going into stealth mode, the OTM or OTP platforms can hide the carrier under the noise floor. At the same time, it is possible to combine VL-SNR carriers under the noise, and normal carriers alongside, in the same bandwidth envelope to avoid consuming extra bandwidth. During an operation, if the OTP or OTM terminal suddenly needs to go into stealth mode, the modem settings can be entered through the GUI and the system will automatically adapt itself in a second without the need for time-consuming frequency planning. To easily interface with a variety of OTM and OTP antennas, the Newtec remote modems and OEM cards comply with the OpenAMIP standard. This IP-based protocol basically facilitates the exchange of information between the antenna controller unit and the Newtec modem. The modem will inform the antenna which satellite to point to, enabling the use of Automatic Beam Switching (see later chapter) when moving across multiple satellite beams. Furthermore, the modem will instruct the antenna to mute the signal in no-transmit zones to meet with government regulations. The Newtec Dialog platform will also compensate for skew and scan angle issues. Depending on the location and positioning of the OTM platform vis-à-vis the horizontal equatorial arc, the system will adapt power and modulation. In certain use cases the power and modulation can even be clamped at a certain level to meet the satellite operator instructions. These instructions can either be fed through the open API available on the Newtec modems or can be triggered via presets on the Newtec modem itself. The interaction with the Newtec Dialog technologies on board the Newtec modems will ensure a maximum throughput without causing ASI when considering small, phased array or flat panel antennas for the network. The Doppler effect gets introduced when objects move. The Doppler effect is the apparent change in frequency in a wave caused by relative motion between the source of the wave and the observer. The Doppler effect impacts the effectiveness of OTM antennas and could degrade the performance of demodulators inside the VSAT hubs and cause link outages. The Newtec Dialog platform has more efficient Doppler compensation technology integrated in the Newtec Mx-DMA return waveform compared to legacy VSAT systems which need extra margin to counter the Doppler effects. 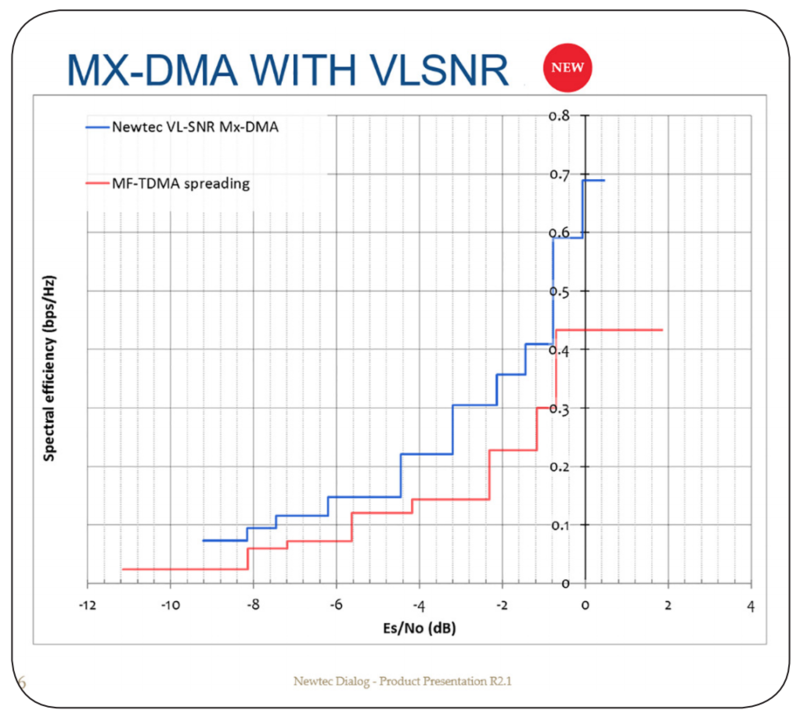 Through the dynamic Doppler compensation technology, the frequency of the Newtec Mx-DMA signal is dynamically offset during the transmission, ensuring the hub receives a constant frequency signal. As such the satellite link performance can be maintained regardless of the OTM terminal’s position, location or movement. Beam switching technology typically comes into the picture when government, defense and first responder operators deploy their networks on a global scale and consider using HTS spot beam satellites. This technology will allow the OTM platform to move across satellite beams from the same or different satellite constellations. As these OTM networks become larger and more complex, there is an accelerated need for more sophisticated beam switching systems. Two key aspects need to be considered when selecting a VSAT platform for beam switching technology. Firstly, does it provide seamless operations and reduce time outage and secondly, does it avoid distribution of GPS coordinates that might reveal the location of the platform? The Newtec Dialog platform includes an advanced central beam switching engine called the Newtec Dialog Mobility Manager. 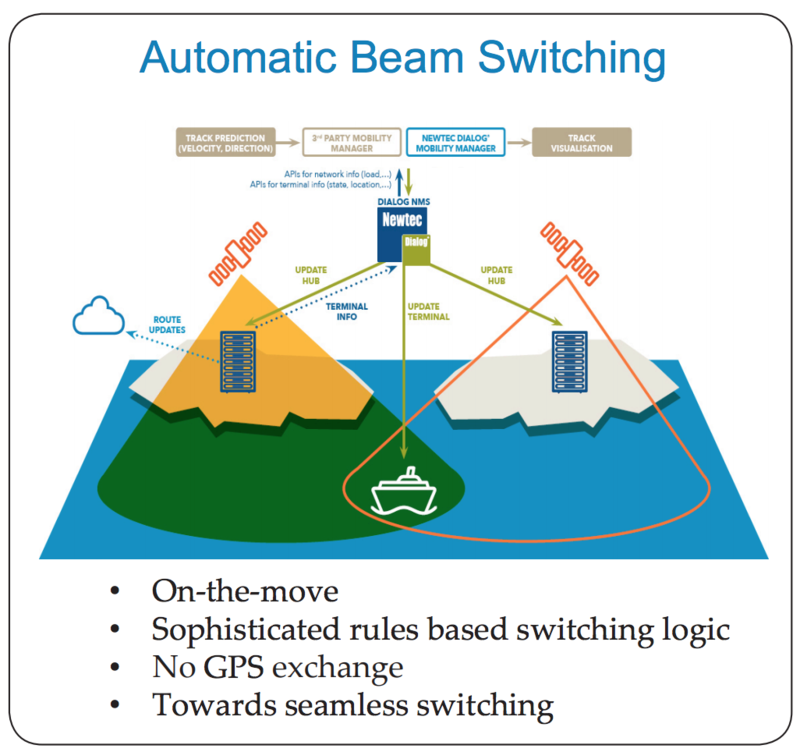 The beam switching decision making can be easily customized to adhere to specific and sophisticated switching rules. While the Newtec Dialog Mobility Manager is a turn-key solution, customers also have the option to implement their own mobility managers, giving them unprecedented control over beam switching logic. As such, the network operators can effectively manage issues like network load balancing, regulatory compliance, and most efficient routing switching towards non-congested, lowest-cost satellite beams. Switching times are literally reduced to a couple of seconds or near-seamless handovers depending on the OTM network implementation (one or two antennas, make before break, etc.). This gives the end-user virtually uninterrupted situational awareness and mission critical communications without packet loss. When OTM terminals are offline due to full shadow blocking effect or if the OTP terminal is being shipped between theaters, a local Automatic Initial Beam Selection (AIBS) process runs on the Newtec Dialog modem to help it join the network, anywhere in the world. 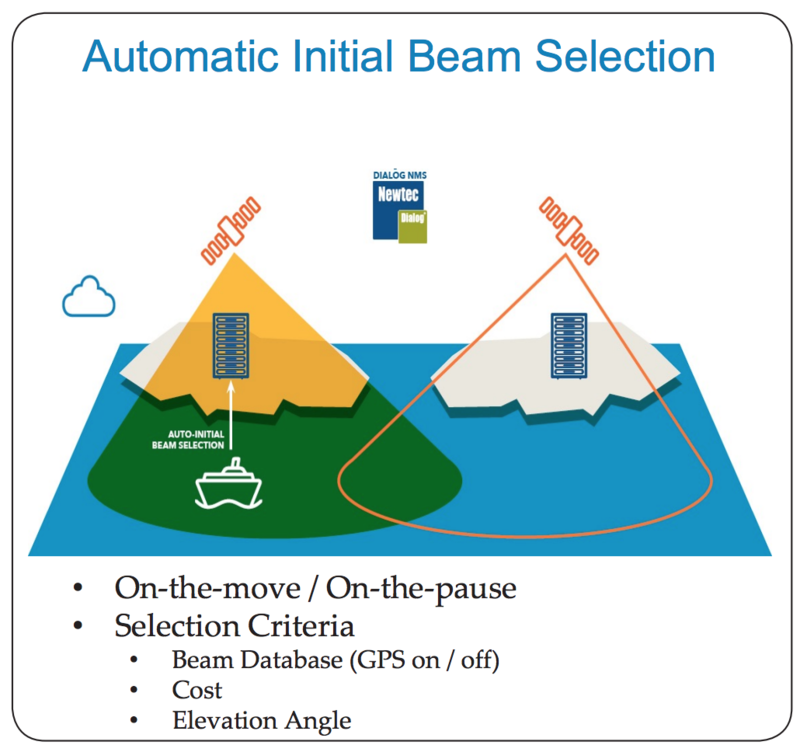 In this process, there is no need for GPS exchange to identify all eligible beams available in a given area. AIBS then uses an arbitrary “cost” variable (e.g. least congestion) and satellite elevation angle (higher elevations are preferred) to sort the available beams. Exclusion zones can be defined on each beam to enforce regulatory restrictions. Beams are tried one at a time in the order determined by AIBS, while respecting any exclusion zones. Once a terminal successfully joins the network, all subsequent beam switches are managed by the Newtec Dialog Mobility Manager. Figure 6. Humanitarian naval use case with two vessels following a human trafficker at sea. OTM and OTP platforms are increasingly confronted with the need to transmit big amounts of throughput (sensor data, HD video, ISR data) over satellite to provide ISR, situational awareness, tactical, welfare and other mission critical services. Legacy satellite systems will typically tackle this demand by deploying dedicated point-to-point SCPC modems and satellite links if the VSAT system cannot handle the requested data rates. With the Newtec Dialog platform the network operator can connect fixed, OTM and OTP terminals on a single VSAT hub or system and share the high throughput forward and return links in the same dedicated bandwidth pool. There are multiple benefits in working with such a configuration. Obviously, it will save CAPEX and OPEX investments because of less equipment at the hub and the gained bandwidth efficiency. On the other hand, the management of the operations becomes easier and more efficient. For example, during a humanitarian operation with multiple OTM terminals (e.g. Navy vessels in Mediterranean Sea) which is using one shared satellite bandwidth envelope on Newtec Dialog, if one of the vessels picks up a high value target (e.g. human traffickers), the Newtec Dialog platform will sense the increased throughput demand and automatically allocate extra capacity to that vessel to get as much granularity and details out of the sensor imagery as possible. This automated allocation will be based on the activation of the sensors and increased incoming traffic demand, as well as Quality of Service and Priority rules presets. During that time the other vessels’ throughput will dynamically be reduced unless the satellite network operator decides to extend the bandwidth. 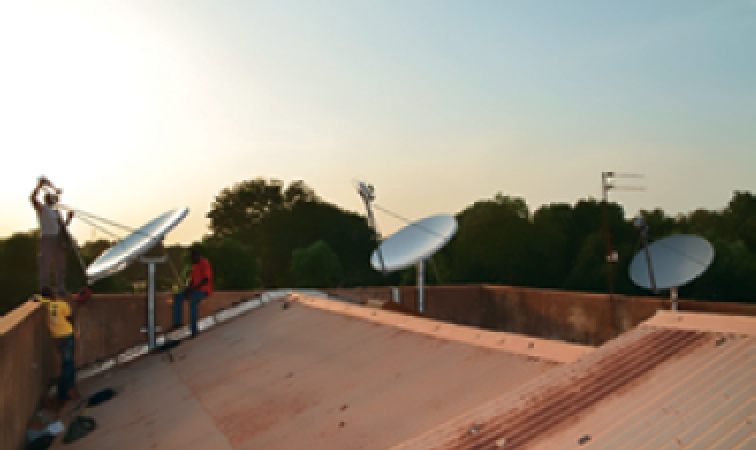 The final step for the peacekeeping, or first responder, satellite network operator is to deploy the Newtec Dialog VSAT platform in an operational context. Planning and managing a VSAT network that covers multiple operations and theaters with a diversity of OTM, OTP and fixed remote platforms is not an easy exercise for network operators because a lot of elements need to be taken into consideration. Figure 7. Efficient management of the SATCOM network covering multiple operations using the Newtec Dialog VSAT platform. Adding a Pooling and Sharing concept to the equation may even increase the complexity. The type of VSAT selected for the job is key to managing the complexity. 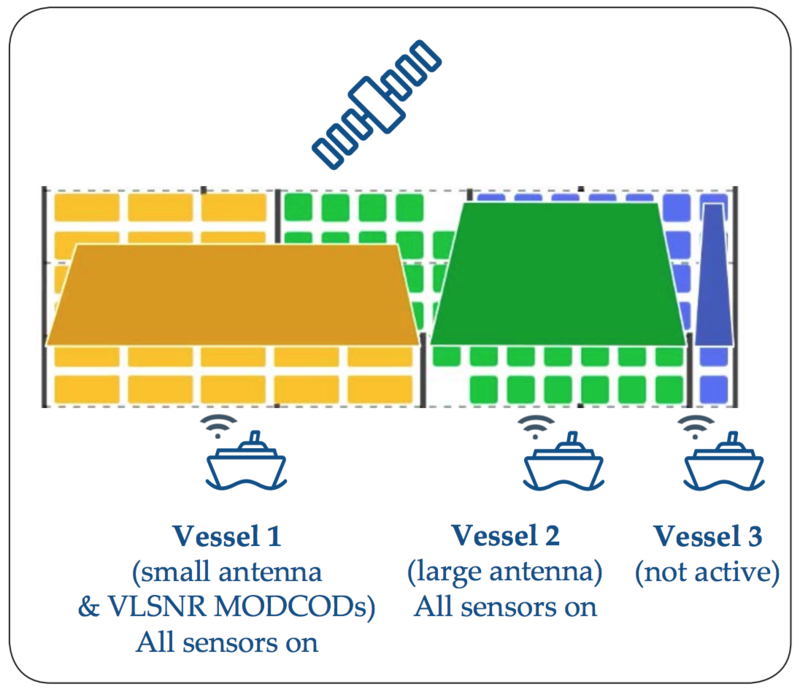 1 (small antenna and VLSNR MODCODs) All sensors on Vessel 2 (large antenna) All sensors on Vessel 3 (not active). The network operator will need to determine the amount of operations and theaters that they want to service from the VSAT network, whether these operations are on a regional or a global scale and what coverage they have to plan. As a result, there might be a need to address multiple satellites, different satellite beams and frequency plans. To add to the complexity, the operations could consist of different platforms (OTM, OTP, nomadic and fixed) and have a variety of services (video, data, voice) running over the satellite links. Each platform demands a dedicated Service Level Agreement (SLA) type with individual throughput, availability and performance requirements. When the platform is OTM (naval, airborne or land vehicles), seamless operations have to be assured, switching between different satellite beams and taking into account small antennas and Doppler effects. The Newtec Dialog VSAT platform embraces the complexity of these kind of peacekeeping and first responder networks over satellite. 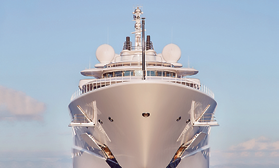 The combination of innovative technologies on board the Newtec Dialog VSAT solution provide the network operator with a flexible, scalable and efficient tool to manage all the different elements on a single platform without compromising on resilience, security or affordability. A key element in the Newtec Dialog toolbox is the Network Management System (NMS) that helps to manage the complex global network over satellite, including OTM and OTP platforms moving across different beams, satellites and satellite constellations. The Newtec Dialog NMS provides a single, scalable, unified interface for all configuration, monitoring and troubleshooting of the platform. Whether a small, dedicated private hub or a large HTS network with teleports at different geographical locations, the Newtec Dialog platform can handle all operations whatever their size. This means network operators can manage their entire globally distributed Newtec Dialog platform from the same NOC. Additionally, the Newtec Dialog Satnet Calculator will help the network planner to set-up and manage the different operations and satellite capacity requirements across the world. Newtec is already preparing the Newtec Dialog platform for future and upcoming satellite architectures. There is no question that HTS technology (GEO, MEO and LEO) is transforming the satellite industry. This evolution in the payload is driving the market to look for new opportunities to exploit the increased performance it can offer. However, for HTS to succeed, this innovation in space must be matched on the ground. This key dependency drives Newtec to ensure the Newtec Dialog terminal and hub technologies are ready to maximize the benefits of HTS, and are never the weakest link in the value chain. A key expertise provided by Newtec will be how to handle future OTM and OTP platforms moving across these new HTS satellites using beam hopping and beam shaping technologies. The need for data to be delivered everywhere will see ‘Communications On The Move’ become an increasingly key Newtec Dialog application. Newtec is already making great strides here, with hundreds of Newtec-designed modems on commercial flights with Panasonic Avionics and integrated into multiple airborne ISR platforms. Beyond this, Newtec is actively working to expand its solutions for upcoming 5G networks. Newtec is working closely in this area with other industry partners such as the European Space Agency (ESA), that includes defining solutions and investigating opportunities for satellite to support 5G across expanded vertical industries. The transformation towards connected vehicles and the IoT will surely define the feature set and design of upcoming Newtec Dialog VSAT releases. VSAT technology needs to embrace the complexity of peacekeeping and first responder networks over satellite. The efficiency of these operations is directly linked to the efficiency of the VSAT platform. Firstly, a multiservice VSAT solution such as the Newtec Dialog platform is needed to allow operators and satellite service providers to build, adapt and manage their networks easily as peacekeeping and first responder operations change or grow. Furthermore, technology to provide flexible and efficient services towards remote fixed locations and platforms that are OTM (land, sea and air) or OTP is required. The Newtec Dialog platform gives the current and future users of the system all the elements to provide efficient services towards OTM and OTP platforms. The combination of existing technology and disruptive innovation seeks to maximize throughput at maximum service availability for mission critical communications over satellite. To cater for OTM and OTP platforms over satellite, the Newtec Dialog platform incorporates the latest and most efficient waveforms DVB-S2X and Mx-DMA, bringing the latest mobility features to the table such as Doppler compensation, advanced beam switching without the need to exchange GPS coordinates, and VLSNR MODCODs that ensure reliability of the link and provide extra security. The Newtec Dialog VSAT platform is ready for high data demands in the return channel which are typical for ISR and situational awareness applications and can offer these kind of services over shared bandwidth. In short, make your move towards Newtec Dialog and ride the wave of efficient, innovative and reliable communications for peacekeeping and first responder networks. Author Koen Willems started his career in 1998 with Lernout & Hauspie as a project manager in the Consulting and Services division. More recently, he joined Toshiba as a Product Marketing Manager for the Benelux and, later, for the European market. In a total of six years, Koen contributed to all of the major Toshiba Retail IT product releases. Mr. Willems is currently the Market Director for Government and Defense for Newtec, a Belgium-based specialist in satellite communications. Koen holds a degree in Germanic Languages (University Ghent, Belgium, 1997) and completed a Masters degree in Marketing Management program at the Vlekho Business School in Brussels (1998). He acquired a Six Sigma Black Belt for product development and process improvement in 2006.